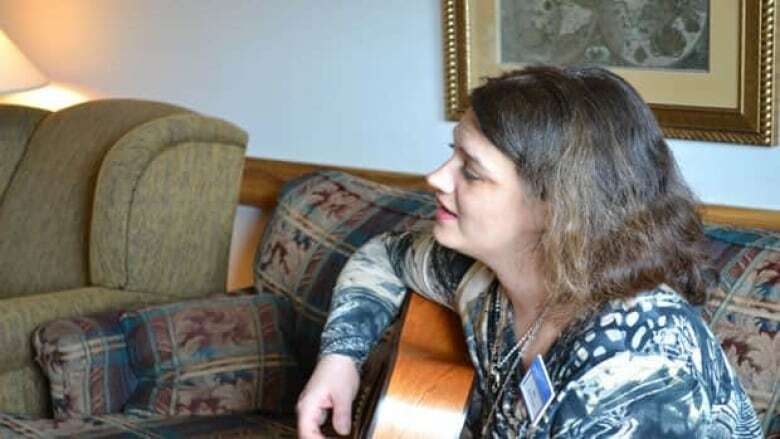 A music therapist helps a dying patient create a legacy project for her family. 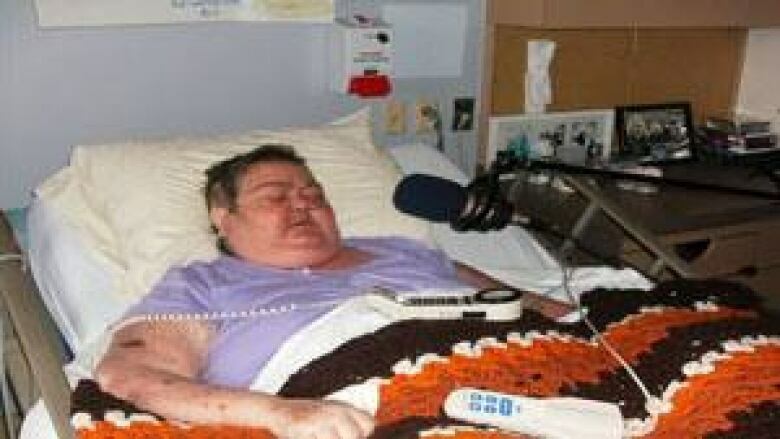 A patient lies in her hospital bed in London, Ont. There’s a blue microphone near her mouth. She attempts to put her thoughts into words to be recorded for her family. Sheri Swick, 48, has a malignant brain tumour and she is in the palliative care unit at Parkwood Hospital. She is working with a music therapist to create a legacy project for her three children and four grandchildren. A legacy project is the message a palliative care patient leaves for their loved ones. Recorded legacies were introduced to Parkwood by Jill Kennedy-Tufts, the music therapist. These projects can be written or recorded letters or songs that the patient or Kennedy-Tufts sings. Swick is working on messages to her loved ones using print and music. "I’m dying of cancer. And, I want to leave something to my kids," Swick said. "I want them to have something when their mom goes, when I go." This kind of project is not for everyone. Kennedy-Tufts looks for specific indicators such as a level of health and a love of music. "Because they have things they want to say to a loved one," Kennedy-Tufts said. "They want to do something special, one last thing to capture their love to give to their children or their loved ones." The project allows for the patient to reflect on their lives and reminisce. Research has demonstrated that legacy work is important for some families because it provides an opportunity to share insights, beliefs, values and it ensures that a part of the deceased will live on. Swick was transferred to a long term palliative care bed on Feb. 25 and soon after she was referred to Kennedy-Tufts. During their sessions Kennedy-Tufts found out that Swick wanted to put something together for her children. "She was extremely gung-ho on doing that and doing as much as we could," Kennedy-Tufts said. The project took several sessions. They were not very long, normally lasting around an hour, but they were tiring for Swick. During one session, Swick dictated a letter addressed to each of her grandchildren which Kennedy-Tufts typed. One letter reads, "Jasmyne, you are such an inquisitive little girl. You have a zest for curiosity and I hope you always will. You are so special and I hope you always keep your zest for life." Swick recorded songs for her grandchildren including Jesus Loves Me andJesus Loves the Little Children. Some people prefer to have the project arrive in the mail after they are gone but Swick decided to tell her family about it now. Her children have mixed emotions about it. Her youngest child, son Tanner, 19, is not sure he will be able to listen to the tape. "Even though he thinks it’s a good idea I still think he’s upset. My son is a very emotional young man," Swick said. Andrew Feron is the social worker in the palliative care unit at Parkwood Hospital. He has seen the impact these projects have had on families and patients. "You know, you often hear from bereaved families and individuals that they forget what their loved one sounded like," he said. "I think that’s the power of it. It brings the person back and you experience them and all the memories come flooding back." Research has demonstrated that legacy work can also assist in the grieving process since it helps create a link between the deceased person and loved ones. A project can help families or individuals realize how their loved ones felt and can allow the patient to recognize that their life had impact, Feron said. "It really helps people do that life review process that’s important, it helps them say goodbye, it helps them let go. There are a lot of purposes," he said. "It’s another way of providing support, not only to patients but to their families and particularly in their grief." Prior to one session, a nurse had to give Swick medication to combat intense pain. In palliative care the patients can deteriorate quickly. As the sessions progressed Swick showed signs of confusion and hallucinations. "I try to get it done as quickly as possible," Kennedy-Tufts said. "I feel badly if it doesn’t get done and if it’s something that someone has committed to really wanting to do for their loved ones." The pain altered the way Kennedy-Tufts continued with the project for Swick. Rather than typing the letters for her to read, Kennedy-Tufts encouraged Swick to say what she felt during each session. They recorded the messages for Swick’s children. "Tanner, it’s Mom. 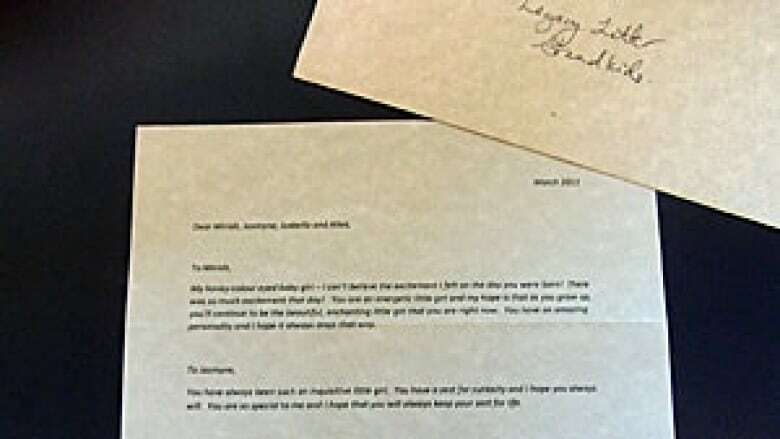 I’m writing you this letter because I may not be here still and this is just my way of letting you know how much I love you and how much I miss you," Swick said. "You and your sisters are the lights of my life." Throughout the recording process Kennedy-Tufts stopped recording to remind Swick that she was doing a good job and helped Swick stay focused. "Ok, Sheri, you’re doing great first of all," she said. "It will mean so much to Tanner to hear your voice reading, talking to him." At the end of each emotional session Kennedy-Tufts comforted Swick. They talked about what gave Swick hope and Kennedy-Tufts played her guitar and sang for her. "Thank you for doing this," Swick said. Once the project was done, Swick appeared relaxed and calm. Editor's note: Sheri Swick passed away on April 14, 2011.